In what could be one of the most significant discoveries in pregnancy research in decades, Australian scientists have discovered a previously unknown cause of birth defects and miscarriages. And that’s only the half of it – they’ve also uncovered a solution, and it could be as simple as increasing your vitamin B3 intake. In the 1990s, scientists made the ground breaking discovery that folate reduces the risk of neural tube defects (NTDs) such as spina bifida in babies. Fast forward to 2017 and Australian researchers have announced a breakthrough that could turn out to be even more transformative for expectant mothers. “It has the potential to be as big or bigger than folate,” says Professor Sally Dunwoodie, an internationally renowned biomedical researcher at the Victor Chang Cardiac Research Institute in Sydney. For most of her career, Dunwoodie has been investigating the genetic origins of birth defects in the heart and spine. When she finally discovered a complex mechanism through which these defects arise, she realised that it was also linked to a heightened occurence of multiple (or recurrent) miscarriages. Understanding why things go wrong in the human body is crucial for better screening and diagnosis, but the real goal is being able to do something about it. That’s why Dunwoodie’s discovery has the scientific community buzzing – she’s not only identified a previously unknown cause of recurrent miscarriages and multiple types of birth defects, she’s also discovered a remarkably simple treatment that appears to be effective, affordable, and readily available over the counter. The key, she says, is plain old vitamin B3 (niacin). “It’s very rare to discover a preventative that’s simple and cheap – we don’t have to develop a whole new drug and test it out in people,” she explains. "And the beauty of that is it could be made easily available for people in developing countries." But how could something as innocous as vitamin B3 change the way pregnant women are cared for? Over the past 12 years, Dunwoodie has been deciphering the activity of an enzyme called nicotinamide adenine dinucleotide (NAD), which the body produces using vitamin B3. NAD is one of the most important molecules in living cells, and Dunwoodie’s team found that low levels of the enzyme can prevent a foetus’s organs from developing correctly in the womb – even if it has no genetic predisposition to these defects. “We found something completely new, and showed that there’s a cause of birth defects that has never been thought of before,” she says. Since her undergraduate years at the University of Sydney, Dunwoodie has been fascinated with all kinds of embryos, and found herself enjoying lectures describing the early development of sea urchins. But as she progressed to her post-graduate research, she set her sights on understanding the infinite complexity of the human embryo. After completing her PhD at the Children’s Medical Research Institute in Sydney, she was invited by Dr Rosa Beddington – one of the world’s pre-eminent embryologists – to complete her post-doctorate at the National Institute for Medical Research in the UK. There she worked with mouse models to gain important insights into the formation of the human embryo. “Mouse embryo development is virtually identical to human development,” Dunwoodie explains. "I was really lucky to get the position with Rosa,” she adds. "It was at a time when no one knew how many genes there were in human and mouse, or what roles they had in embryos. We knew very little about which genes would drive the development process." 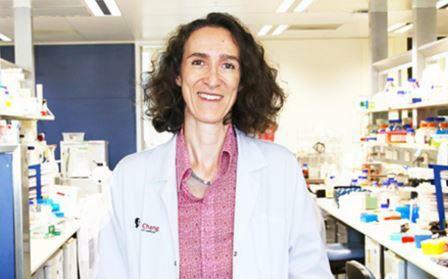 Returning to Australia in 2000, Dunwoodie set up her lab at the Victor Chang Institute. She started recruiting families who had babies with heart and vertebral column defects, and sequenced their genomes to figure out the origins of these defects. Over the course of their study, Dunwoodie and her team read the genomes of more than 150 families from around the world. But their first big break came in 2008, when they discovered that one child’s birth defects were caused by a mutation in a gene called HAAO – but they could not figure out how. In 2014, Dunwoodie found another child with similar defects and a mutation in the KYNU gene. This was a “eureka moment” as HAAO and KYNU have related functions in our cells. In 2015 they found a third child’s birth defect was linked to HAAO, and a fourth to KYNU in 2016. This was a major breakthrough, because the thing that both genes had in common was NAD – if the genes weren’t working properly, they would block the body from producing enough of it. Dunwoodie and her team immediately tested this out in mice by blocking the activity of HAAO and KYNO to see if the pups would be born with defects. Oddly enough, the babies were fine, and somehow their NAD levels were still normal. When the team reduced the dietary niacin in the mice, their pups developed the same defects as the children, and were more likely to miscarry across multiple pregnancies. It’s important to note that birth defects and miscarriages are caused by an array of genetic and environmental factors, and Dunwoodie does not claim that boosting niacin levels can prevent all malformations. There isn’t a blanket cure for all women. Additionally, vitamin B3’s protective effects have so far only been tested in mice – the team needs to prove its effectiveness in trials involving large groups of women before they can know for sure that it works. Dunwoodie says she’s eager to get these trials started, and is now looking for funding to conduct them at the Victor Chang Institute to further Australia’s medical research capabilities. Researchers are now working on developing a diagnostic test to measure NAD levels to enable doctors to identify women who are at greatest risk, and ensure they are getting sufficient vitamin B3. Find out more about the Victor Chang Institute.